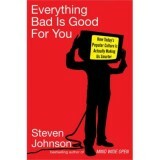 Stephen Johnson\'s book, Everything Bad Is Good For You: How Today\'s Popular Culture Is Actually Making Us Smarter, is a great read, and he brings up a lot of valid points about the increased complexity of popular entertainment. And, having just made many of the arguments relevant to the old \"Are videogames the devil?\" argument in his book, it must have been fairly straightforward to parlay that knowledge into the LA Times editorial he addresses to Senator Hillary Clinton. So while we\'re waiting for hell to freeze over here in Buffalo (or the Bills to win the Superbowl, whichever comes first), we can check out Johnson\'s op-ed piece and arm ourselves with some facts to use against those Bible-thumpin\' law-talkin\' guys. \"I\'d like to draw your attention to another game whose nonstop violence and hostility has captured the attention of millions of kids - a game that instills aggressive thoughts in the minds of its players, some of whom have gone on to commit real-world acts of violence and sexual assault after playing. I\'m talking, of course, about high school football. I know a congressional investigation into football won\'t play so well with those crucial swing voters, but it makes about as much sense as an investigation into the pressing issue that is Xbox and PlayStation 2.\"